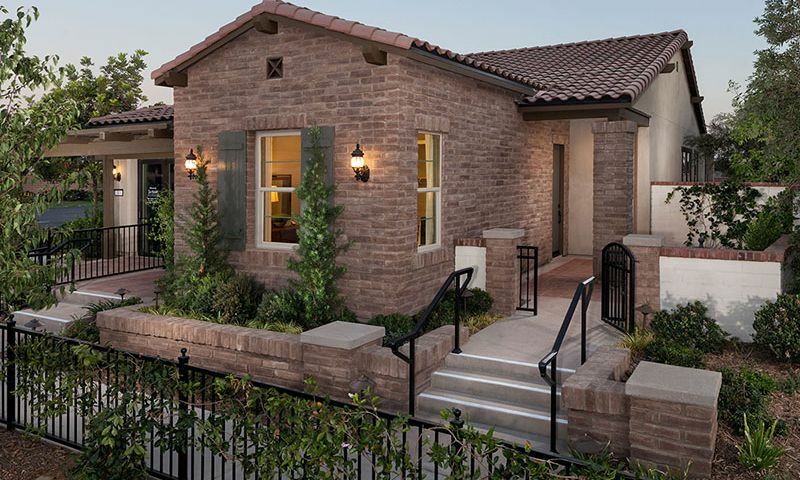 Buena Vida at La Floresta is a new 55+ community in Brea, California. Premier builder Del Webb acquired 41 acres within the master-planned community of La Floresta and will develop 267 homes in the gated Buena Vida section upon completion. True to their brand, Del Webb offers innovative home designs as well as private resort-style amenities that cater to the active adult lifestyle. This beautiful neighborhood is a sought-after age-restricted community because of its close proximity to Los Angeles and all of its attractions. An exclusive clubhouse for 55+ residents of Buena Vida is where all the fun and excitement starts. The clubhouse is the focal point of the community where homeowners gather for social interaction and physical activities. Amenities include a fitness center, lounge, ballroom, catering kitchen, and multi-purpose room. Residents also have plenty of time to spend outdoors enjoying the beautiful Southern California climate with a sparkling pool, spa, and patio. Del Webb broke ground in 2016 and offers three distinct collections of single-family homes and condominiums. The New Home Company broke ground on the condominiums, Agave at La Floresta, in 2017. Upon completion, the buildings will offer 80 active adult condo units in four different floorplans. These floor plans range in size from 1,389 to 1,726 square feet in size and come with two or three bedrooms, two bathrooms, and each unit gets two garage spots in the building lot. In these state-of-the-art residences, homeowners will enjoy features like private deck areas, open living areas, large master suites, and elevator access to each floor of the building. Active adult homebuyers can choose from five elegant floor plans in the Solana Collection. These detached homes offer 1,401 to 2,119 square feet of living space with two or three bedrooms, two or three bathrooms, and an attached two-car garage. They feature one or two-story living, spacious master suites, gathering rooms, gourmet kitchens, and covered patios. The Olvera Collection offers three unique floor plans ranging in size from 2,216 to 3,041 square feet. These single-family homes have two to four bedrooms, two to three bathrooms, and an attached two-car garage. Some features include inviting living areas, elegant master suites, luxurious fixtures, and plenty of options for customization. Residents of Buena Vida at La Floresta will enjoy their old hobbies or pick up new ones with all their free time thanks to a homeowners' association that takes care of common area maintenance for them. Instead of taking care of chores, they enjoy their time playing pickleball, attending holiday parties and social events, and participating in arts and crafts. Located in the Orange County area, Buena Vida residents are close to daily conveniences, shopping, and attractions. Less than ten minutes away, homeowners find Walmart, The Home Depot, Brea Mall, and Brea Union Plaza for all of their retail needs. Easy access to Route 57 makes driving around town a breeze. Golfers and outdoor enthusiasts have several options nearby including Carbon Canyon Regional Park, Chino Hills State Park, Birch Hills Golf Course, and Black Gold Golf Club. Big-city entertainment can be found in Los Angeles, which can be reached in 40 minutes. Active adults love all of the amenities and nearby attractions in Buena Vida at La Floresta in Brea, CA. There are plenty of activities available in Buena Vida at La Floresta. Here is a sample of some of the clubs, activities and classes offered here. The New Home Company broke ground on the condominiums, Agave at La Floresta, in 2017. Upon completion, the community will offer 80 active adult condo units in four different floorplans. These floor plans range in size from 1,389 to 1,726 square feet in size and come with two or three bedrooms, two bathrooms, and each unit gets two garage spots in the building lot. In these state-of-the-art residences, homeowners will enjoy features like private deck areas, open living areas, large master suites, and elevator access to each floor of the building. Active adult homebuyers can choose from five elegant floor plans in the Solana Collection. These detached homes offer 1,401 to 2,119 square feet of living space with two or three bedrooms, two or three bathrooms, and an attached two-car garage. They feature one or two-story living, spacious master suites, gathering rooms, gourmet kitchens, and covered patios. Please Note: Floor plans are not available at this time. The Olvera Collection offers three unique floor plans ranging in size from 2,216 to 3,041 square feet. These single-family homes have two to four bedrooms, two to three bathrooms, and an attached two-car garage. Some features include inviting living areas, elegant master suites, luxurious fixtures, and plenty of options for customization. Please Note: Floor plans are not available at this time. 55places.com is not affiliated with the developer(s) or homeowners association of Buena Vida at La Floresta. The information you submit is distributed to a 55places.com Partner Agent, who is a licensed real estate agent. The information regarding Buena Vida at La Floresta has not been verified or approved by the developer or homeowners association. Please verify all information prior to purchasing. 55places.com is not responsible for any errors regarding the information displayed on this website.